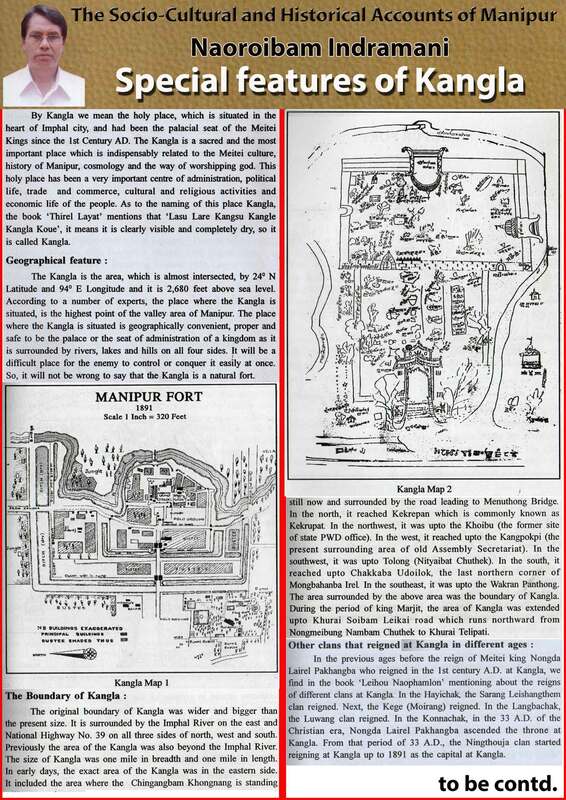 By Kangla we mean the holy place, which is situated in the heart of Imphal city, and had been the palacial seat of the Meitei Kings since the 1st Century AD. The Kangla is a sacred and the most important place which is indispensably related to the Meitei culture, history of Manipur, cosmology and the way of worshipping god. This holy place has been a very important centre of administration, political life, trade and commerce, cultural and religious activities and economic life of the people. As to the naming of this place Kangla, the book “Third Layat” mentions that “Lasu Lare Kangsu Kangle Kangla Koue”, it means it is clearly visible and completely dry, so it is called Kangla. The Kangla is the area, which is almost intersected, by 24° N Latitude and 94° E Longitude and it is 2,680 feet above sea level. According to a number of experts, the place where the Kangla is situated is the highest point of the valley area of Manipur. The place where the Kangla is situated is geographically convenient, proper and safe to be the palace or the seat of administration of a kingdom as it is surrounded by rivers, lakes and hills on all four sides. It will be a difficult place for the enemy to control or conquer it easily at once. So, it will not be wrong to say that the Kangla is a natural fort.